A few months back, my customer (Shirley) had come to me with a request to create a beaded necklace she saw in New York City, while on vacation years ago. She had asked numerous other designers to re-create it, but with their limited resources, knowledge and artistic skill, Shirley was disappointed each time she was turned away. When she came to me through a referral, she had a black and white picture of the necklace and a list of the potential beads used in the design. Although I was not familiar with silk knotting, I cheerfully said I could do the design and looked forward to the challenge. I got to work searching out similar beads and components and some time after that initial meeting I was able to gather all the necessary supplies to handle this custom jewelry request. Although as I began the project I found no custom job is ever without bumps in the road. It literally took almost two months to actually finalize this necklace but the end result was fabulous!! With a few changes made to the overall design the customer was very pleased and inquired if the necklace could be made in other colors as well! What went into the design of this necklace? Swarovski crystals (of course! ), 14 karat gold fill bead caps and components, nylon silk cord and the technique of knotting. 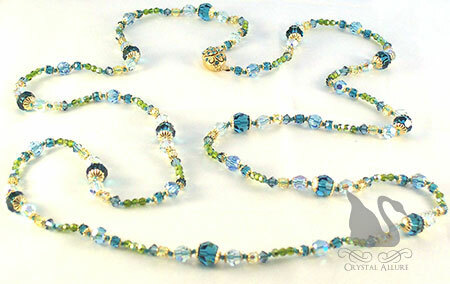 The focal of this stunning 45" necklace is the goldtone Starry Night Swarovski Crystal box clasp. This designer clasp is customizable because you select the crystal rhinestone color you want for your particular design. Designer Tip: Check out Mimisgems.com for these designer style box clasps. If you are interested in purchasing this necklace or one that is similar to this design, please contact us with your custom design request. So why knot when doing so is a lot more trouble than simply stringing beads? • The beads look better. The knots space the beads, allowing you to see each bead better. • Beaded necklaces (and bracelets) that have been knotted have a more finished and luxurious look. • If the necklace ever breaks, only one bead will be lost. • The necklace is less likely to break. The sharp part of the bead hole tends to wear against the reinforced knot, not the thin bead cord. • Softer bead materials (such as pearls, malachite, or coral) are prevented from rubbing together and abrading the sides of the beads. 3. Use the same knotting technique throughout the design. Color: (Option 1) Select thread to match the color of the beads -or- (Option 2) Select thread that is slightly darker in color than your focal bead. 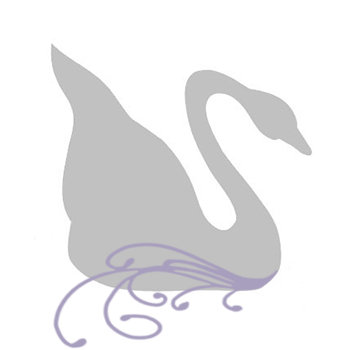 Type: Silk is the preferred cord for knotting, especially pearls. Nylon cord will work when a stronger, thicker cord is necessary. Thickness: Use a thickness of cord that when doubled (2 strands) fits snugly inside your bead. Most beads are drilled with a 1.0mm diameter hole. For soft bead materials such as pearls, silk cord in size E or F works well. For harder materials like black onyx, garnet, or rose quartz, use nylon cord in size 2 or silk in size F for 8mm beads. Length: You’ll need a length of cord at least four times the length of your finished necklace, for example, an 18" necklace will need at least 4x18"=72" or 6 feet. On the last two knots either: (1) put a tiny drop of a thin adhesive such as Hypo Tube Cement or (2) clear nailpolish. When dry, carefully trim off the excess cords. For more information on bead knotting, simply do a search on the internet or shop your local book store for jewelry books using this technique. You won't be disappointed by incorporating this technique into your jewelry designs!